The veil between the mind and the Supermind transmits an image of the Truth, not Truth itself. The image gets inevitably distorted during transmission so that the mind which itself is divided, cannot receive Truth in its plenary effulgence, in its purity, in its totality. (b)	Secondly, ‘we perceive also that all that the ignorance of Mind took for the truth was in fact truth but truth deflected, mistaken and falsely conceived’ (Ibid). The true role of the mind cannot be judged at the level of the mind which is itself divisive. At best, at the level of the mind, we have to acknowledge the divisibility without which the diversity and variability in creation lose significance. It is only at the level of the Supermind that the true role of the mind can be grasped. The Supermind delegates the mind as its subordinate to fulfil a particular objective. ‘Mind fulfils luminously its function which is in the Truth to hold forms apart from each other by a phenomenal, a purely formal delimitation of their activity behind which the governing universality of the being remains conscious and untouched. It has to receive the truth of things and distribute it.... It has to uphold an individualization of active consciousness.... It has to turn the multiplicity of the One into an apparent division by which relations are defined and held off against each other so as to meet again and join... The mind is the final operation of the apprehending Truth-Consciousness which makes all this possible, and what we call the ignorance does not create a new thing and absolute falsehood but only misrepresents the Truth. The Ignorance is the Mind separated in knowledge from its source of knowledge and giving a false rigidity and a mistaken appearance of opposition and conflict to the harmonious play of the supreme Truth in its universal manifestation’ (Ibid.184-185). The fundamental error of the Mind is that it loses the knowledge of integrality while dealing with the exclusivity. ‘The fundamental error of the Mind is, then, this fall from self-knowledge by which the individual soul conceives of its individuality as a separate fact instead of as a form of Oneness and makes itself the centre of its own universe instead of knowing itself as one concentration of the universal’(Ibid, pg 185). However, Sri Aurobindo stresses that even the knowledge of the exclusivity, however precise, meticulous and atomically perfect it may seem is yet not devoid of at least an element of error. The error of any knowledge of any particularity cannot be correct in the integral world-view as everything is interdependent on everything else that has blossomed in the universe and programmed in the Integral Consciousness of the Supermind. ‘Hence there is an element of error in all human knowledge’ (Ibid). There are also philosophies who view everything in a flux or flow. Sri Aurobindo also considers this perspective to be limited unless the creative essence of the Supermind that has sanctioned the flow is acknowledged. ‘For, viewing the flux of things only as it flows upon and through itself, it makes a limitation of being from which proceeds a limitation of consciousness.. (Ibid). 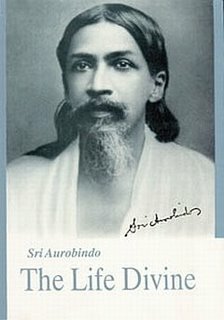 Sri Aurobindo emphasizes that all ignorance and perversity of the mind represents ‘only the distortion of the truth and right of things and not the play of an absolute falsehood’ (Ibid). The redemption is to go back to the Godhead, the Truth from which it fell. ‘If it gets back to the truth from which it fell, it becomes again the final action of the Truth-Consciousness in its apprehensive operation... Now we have rather the warped and zigzag movement of mind and life, the contortions created by the struggle of the soul once grown oblivious of its true being to find itself again, to resolve back all error into the truth which both our truth and our error, our right and our wrong limit or distort, all incapacity into the strength which both our power and our weakness are a struggle of force to grasp, all suffering into the delight which both joy and our pain area convulsive effort of sensation to realise, all death into the immortality to which both our life and our death are a constant effort of being to return’ (pg 185-186).